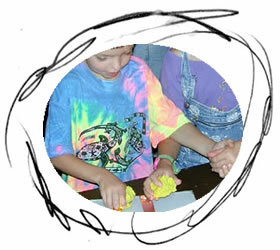 This project lends itself to experimentation: play with the Play-Doh, try different materials, try changing the program. An audio cable to connect the MIDI board to the speakers. 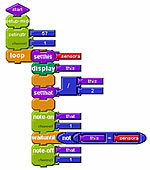 Make a sensor. To make the part that plugs into the Cricket's sensor port, cut two pieces of wire about 10 inches (25 cm) long. Use the wire strippers to strip the plastic coating off one end of each of the wires, exposing about 1 inch (2.5 cm) of wire. Cut a small piece of cardboard to hold the wires that will plug into the sensor port. Make two marks on the cardboard that show you where the holes in the port are. Attach the wires to the cardboard. Line up one end of each piece of wire with a mark on the cardboard, leaving about 1/2 inch of bare wire extending beyond the cardboard. Wrap tape around the cardboard to hold the wires in place. Next, strip the plastic coating off of the loose ends of each wire, exposing about 3 inches (7.5 cm) of wire. Cut a piece of cardboard about 8 and 1/2 by 11 inches. Tape two pieces of foil to the cardboard, leaving a gap of about 2 inches (5 cm) between the two pieces of foil. Tape one wire to each piece of foil, pressing the tape down firmly to make sure the exposed wire makes a good contact with the foil. Here's what your finished sensor will look like. Make a circuit using: the aluminum-foil sensor and the Play-Doh. Plop the playdoh down in the center of the cardboard touching both pieces of foil and plug your sensor into your Cricket to complete the circuit. Here's a program to try with your music sculpting machine. And here's a larger image of this program. Squeeze, shape, and sculpt the Play-Doh. What kind of sounds can you make? You may want to try making a sculpture to see what sound it makes. What other materials could you experiment with? Learn to make musical Wandering Wands.